There is a huge variety of things you can buy. 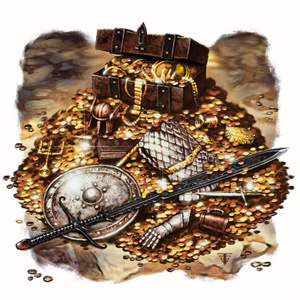 The website d20pfsrd has everything organized into MUNDANE EQUIPMENT (which includes non-magical weapons, armor, and adventuring gear) and MAGIC ITEMS. 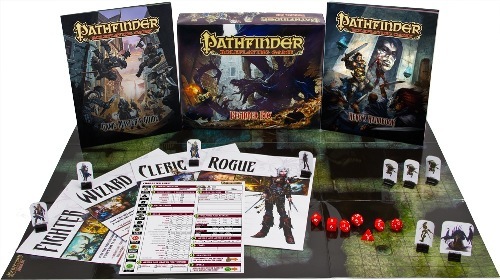 Note that you can ONLY buy things from a Paizo publication — anything from a “3rd party” book is not allowed! Remember that for Guild characters set in Gildhaven, you must FIND the item in a magic shop! See the Available Magic Items page for items that are currently available in or around Gildhaven. Composite shortbow (75+ gp) or composite longbow (100+ gp): Composite bows let you add your STR modifier to your arrow damage — you must have that STR mod or you take a penalty to accuracy! Every +1 in STR costs 100gp. A composite (+1 Str) longbow (1d8+1 damage) is 200gp, and a composite (+2 Str) longbow (1d8+2 damage) is 300gp! Yep! It’s why I made it.